Desmond Payne has done it again. Following on the success of Beefeater 24, Payne’s modern take on the iconic Beefeater London Dry Gin, the Master Distiller has unveiled a limited-release, seasonal gin: the Beefeater Summer Edition. I first encountered the Summer Edition this past spring at the Gin Symposium, when Payne and Plymouth Gin Master Distiller Sean Harrison conducted a gin tasting that included the Summer Edition. The samples we tasted that afternoon were from a pre-production, unmarked bottle. But even then, we could tell this lighter variation would be perfect for the summer months that lay ahead. Knowing that summer would be over as quickly as it arrived, the Booze Fairy sent a review bottle of the Summer Edition last weekend. 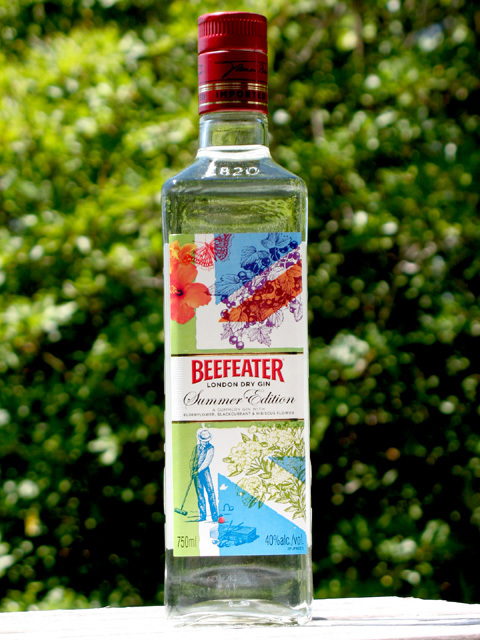 The Beefeater Summer Edition is based on the nine botanicals used in the original Beefeater, with three English-inspired ingredients added to the mix: elderflower, blackcurrant and hibiscus. The gin’s signature juniper kick has been downplayed, while the summer flowers enhance its citrus notes. The Summer Edition is distilled to 40% ABV (compared to Beefeater’s standard 47% ABV) for an overall softer, lighter gin profile. For those who think of gin as the quintessential summer spirit, they’ll find Beefeater Summer Edition to be the gin of the season. The Beefeater Summer Edition Gin is available now in limited release through the end of summer. For more information, visit beefeatergin.com. Nose – Initial sweet, floral and citrus notes, and light juniper. Taste – Sweet, floral notes of elderflower blossoms and hibiscus flowers on entry, then citrus and fruit, with juniper at the end. Finish – Long, smooth, and bright. The Summer Edition bottle is subtly designed, with a bright label that features graphics of the new botanicals, a stylized Union Jack, and a dapper croquet player. The sides of the bottle are embossed with the words “MADE IN” and “LONDON” on either side. The attached bottle necker includes a recipe for a Summer Serve, a 1:3 mix of Beefeater Summer Edition and cranberry juice, served over ice with a lime wedge. Mixing the Summer Edition in a Gin & Tonic, Gimlet, or Negroni will give refreshing twists to these classics. And it goes without saying, the Summer Edition and the Pegu Club are a match made in cocktail heaven. But I was really looking forward to trying out the new release in a recipe from the forthcoming Left Coast Libations cocktail book. For the past few weeks I’ve been enjoying a preview copy of Left Coast Libations (LCL), an informative and witty book by Ted Munat and Michael Lazar. LCL gathers 100 cocktail recipes created by 50 of the West Coast’s most influential bartenders, from Los Angeles to San Francisco, Portland, Seattle and Vancouver. Local stars featured in LCL include Eric Alperin, Joseph Brooke, Marcos Tello and Damian Windsor. A full review of Left Coast Libations will be posted soon. In the meantime, I used the Beefeater Summer Edition in the Celeriac, an LCL cocktail from Portland’s Kelley Swenson, who recently left Ten 01 to head the cocktail program at June. The Celeriac is Swenson’s take on a Gin Sour, just the type of summery libation that is the new Beefeater’s raison d’être. The bright, well-balanced Celeriac has a wonderful flavor profile that ranges from the sweetness of the pineapple and Rich Simple Syrup to the tart lemon. The foamy egg white gives the Celeriac its rich texture, while it softens the sweet and sour notes. The celery seed, citrus and floral notes of the bitters provide depth and complexity. The Beefeater Summer Edition shines in the Celeriac, with the gin’s delicate botanicals elevating a top notch cocktail to the level of a newfound summer classic. Left Coast Libations will be published in September 2010, with a suggested retail price of $24.95. For more information about Left Coast Libations, visit leftcoastlibations.com. Dry shake all the ingredients without ice. Add ice and shake some more. Double-strain into a large cocktail glass or champagne coupe. 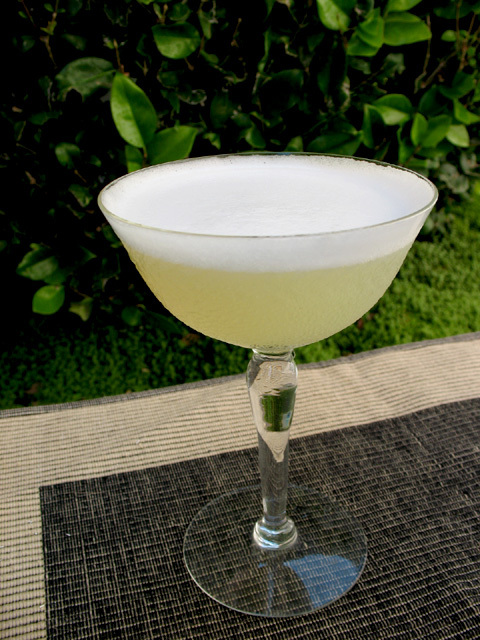 Optional but recommended: pour some celery bitters in an atomizer or Misto pump. Spray a mist of the bitters across the top of the drink to finish.